Barney Norris’ new play Echo’s End, like so much First World War drama before it, is infused with an august Rupert Brooke wistfulness, a mixture of melancholic nostalgia and hazy remembrance. But it’s also refreshingly unconventional in its approach, presenting a nuanced not-quite-love story that adroitly skirts stereotype. It has a gentle, downbeat power. John (a terse Tom Byrne) and Anna (a playful Katie Moore) are two childhood friends, born and bred in the idyllic Wiltshire countryside. John loves Anna, but Anna doesn’t – can’t – love him back. When war arrives on the Salisbury Plain (also the location of Norris’ debut novel) in the form of a bustling army training camp, John signs up, fleeing rejection in hope of a waved, tear-stained handkerchief on his departure and a warm embrace upon his return. Except things don’t quite works out like that. 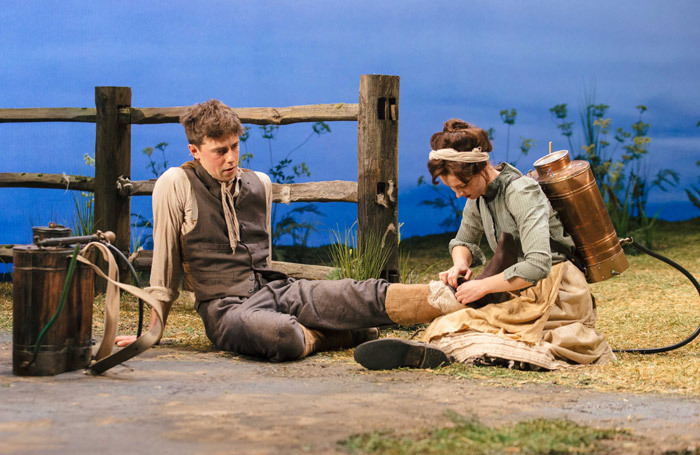 Alice Hamilton’s production, a careful study of rural life, complete with hay-chewing farmers, takes its time. Designer Tom Rogers has created a gorgeous, bucolic corner of a Wiltshire field. While a trio of yarn-spinning old-timers are too caricatured to wholly convince, Byrne and Moore’s fine, evolving performances are matched by that of Oliver Hembrough as the earnest Anzac, mature beyond his years. Echo’s End infrequently lapses into twee sentimentality, but it is also compellingly articulate about the perspective-altering effect of war. Aided by the performances of Byrne, Moore and Hembrough, it winds up finding an elegant, arresting, Chekhovian futility.